Political Corruption in Australia: A Very Wicked Place? This title was first published in 2001: Despite considerable expansion, the scholarly literature on political corruption has remained fragmentary, often polarized, consisting either of sweeping systematic statements, or case-specific examples. 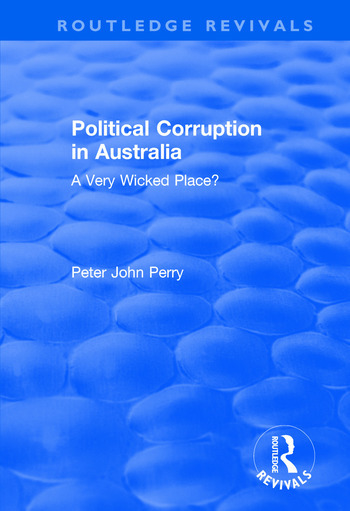 Perry bridges this gap and proves the need for further such study in this most worthwhile examination of the place of political corruption in Australia. The Australian experience is paid thorough, yet concise attention and then it is related to the concept of political corruption in its various and changing forms and interpretations. Assuming no familiarity with the central intellectual issues, Perry lucidly explores them in terms of their method, practice and definition with particular reference to Australia. Primarily suitable for academics interested in politics, geography, development studies, history and sociology, this book’s accessible style also makes it of interest to a general audience. Contents: Introduction; Geographical and historical dimensions; Convict Australia; Colonial Australia; Corruption concealed - a complacent commonwealth; Contemporary; Causes and characteristics; A consequential conclusion; Updates; Bibliography; Index.